The best compliment that I can give “Iron Hans”—and it’s an episode that earns itself a lot of compliments—is that it earns the title of “game changer” without any need for clarification. Throughout the lifespan of Grimm, fans have always been able to rely on one constant, the reliability of Aunt Marie’s Airstream to solve any problem facing the team. And now at the end of this week, that Grimm institution (Grimmstitution?) is reduced to ash at Juliette’s hands. Centuries of research, resources, and weaponry have gone up in smoke, a betrayal that was entirely her choice to make and one accompanied by a woge that’s nothing short of triumphant. The decision to burn things down literally and metaphorically caps off what’s easily the strongest episode of Grimm since the show returned from hiatus, and also a contender for best episode of the season. I’ve regularly complained about how the multiple plotlines have made it hard to focus on any one thing at a time, and “Iron Hans” benefits from both narrative and thematic tightness. Characters are interacting with each other rather than heading off on random adventures, history between them pays off in satisfying fashion, and for the first time in a while it feels like there’s a destination for the madness. Much of that impetus comes from Prince Kenneth, who in only three appearances has proven himself to be the most efficient agent of the royal family in Grimm history. His hands-on attitude goes past simply laying a beatdown on Renard and extends to psychological manipulation, as he identifies Juliette as someone he can co-opt and Adalind’s pregnancy as the right detail to get her good and worked up. Nico Evers-Swindell continues to invest Kenneth with the perfect amount of smugness and menace, his cold dismissals and cruel jokes (“She’s having what should be your baby with your boyfriend”) keeping him solidly in the role of the villain you love to hate. One of those dismissals finally convinces Adalind that the royals no longer have any interest in whether she lives or dies, and pushes her back into the wider Grimm world. Adalind’s been trapped in the other side of the show for so long that it’s a breath of fresh air to see her interacting with the rest of the cast, her reunion with both Nick and Renard loaded with the strange and twisted history they all share. (The highlight of that scene being the way both react to the first sight of her baby bump. Nick to Renard: “Again?”) Refreshingly, no one tries to suggest that this is the start of a beautiful friendship, Adalind outright stating that she’s only here out of necessity and self-preservation. More encouragingly, any thought that Nick might sweep their conflicts under the rug in favor of newfound paternal instinct is dismissed immediately, as he recoiling from her hands and stomach as if they were razor-sharp. “I honestly don’t think this could get any more complicated,” Renard laments, one of those Murphy’s Law statements that’s just begging to be proven wrong. And proven wrong it is, as Juliette shows up at the exact same time Nick and Adalind are walking out of the station. This entire twisted domestic dispute is a joy to watch, Juliette’s anger versus Adalind’s fear and Nick caught in the middle, compounded by the fact that it’s playing out in front of an increasingly confused police department. It feels entirely plausible that one or the other could start throwing magic at each other, or that Nick will have to do something he’ll regret. And the final look that Juliette gives before leaving is her darkest yet: getting between the two of them an action that she can’t interpret as anything other than betrayal. That face-off sends the two Hexenbiests careening in opposite directions. An ever-more rattled Adalind flees to the spice shop in order to research a potential suppression of Juliette’s Hexenbiest powers, which sets the latest quest in motion. While the search for cures and reagents is one that Grimm has done a time or ten before, this one kicks it up a notch by making the key ingredient the body of the elder Schade. (“Well, she couldn’t help if she was alive,” Adalind matter-of-factly states to Rosalee.) Circumstances are odd enough that she’s even associating herself with Team Grimm, so it feels appropriate for things to go in an even more extreme fashion. Juliette continues the role reversal by accepting Kenneth’s offer for a meeting that turns into a job offer: “Will you be a pawn, or will you be a queen?” It’s the next step in her Dark Willow evolution, and it’s happening at the right time in the narrative—she can only blow up cockroaches with her mind for so long before it turns into a rut, as cool as that is to witness. Her gradual acceptance and enjoyment of her power transforms her into a true wild card, and given how diffuse the story already is it’s rewarding that for the time being she’s allying herself with the royals rather than striking out on her own. All of that goodness and I haven’t even gotten to the case of the week yet, and the fact that it’s taken this long to get to a story featuring the excellent Jeff Fahey is further proof of the quality of “Iron Hans.” Fahey plays the head of a weekend camp for Wesen adolescents, teaching them a connection to their more primal side in order to ease the experience of the first woge. 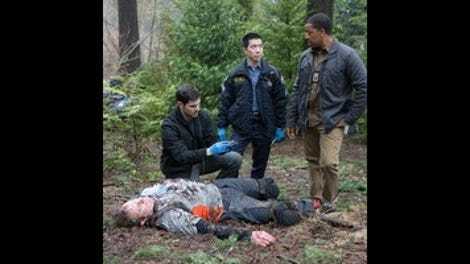 It’s often a relief when Grimm uses its pool of existing Wesen rather than trying to dream up a new one, as it means that it can spend that time exploring deeper ideas or different combinations. “Iron Hans” does that by presenting the idea of Wesen maturity in a positive light, exploring the struggle of what it means to know you have these abilities—and doing so at the same time Juliette’s story gets into how dangerous it can be to simply be handed these gifts. If there’s a problem with the story, it’s in the abruptness of the reveal. The episode manages to maintain a level of mystery by setting up a large list of suspects—traditionalist Hans, his obnoxious son, pre-woge kids who may not be able to handle their power, fathers who may be concealing a dark side—that steers away from the pattern of recent Grimm episodes that set the killer up instantly. So much time is spent on the buildup that the reveal of Hans’s daughter as the killer comes out very quickly by comparison, and her death (at the hands of an anonymous near-victim no less) is even quicker. Not that I’d trade more of those scenes for less of the other arcs, but Maggie needed more time to register so her death could be treated with greater import. The highlight of this story is the scene where Monroe gets invited to address the camp. A discussion about his experiences as both a hunter and someone who’s rejected the hunt draws off long-established traits of Monroe’s, and Silas Weir Mitchell is both convincing and comfortable in exploring the duality of his personality. The catch in his throat when he talks about the feeling of blood, the way he tries to dissuade the youths from praising his time as a predator, and the way he looks at Maggie when she offers the hunt to him—all are indicative of the struggle that he wages on a daily basis, and what makes him one of Grimm’s most consistently interesting characters. “Fight the instinct that draws you to blood,” Monroe urges to the group. It’s advice that everyone on Grimm should be heeding given the degree to which all hell is breaking loose, and advice that Juliette is determined to throw on the fire along with every last Grimm tool and talisman. While no actual blood has been spilled yet, that possibility is now very much on the table, as “Iron Hans” makes it clear nothing on Grimm can ever be the same again.